Before even talking about the book itself let me first say that the quality of this picture book was amazing. The publishing ability of Subterranean Press far exceeds even my high standards. This book is absolutely stunning and truly deserves it’s place on any collector’s or book enthusiast’s shelf. Now as for The Adventures of the Princess and Mr. Whiffles, this twisted fairy tale is book to be treasured. The simple act of flipping through this picture book for adults will bring a smile to your face as you draw comfort from memories of the first picture book you ever read. However unlike those stories this one doesn’t end with happily ever after, instead you get to see the Princess for who she truly is. If on the other hand you like everything rainbows and gum drops stop at the first ending, what comes after will surely be devastating. To be honest I must confess I have mixed feelings about this book. Although I enjoyed the book I find it did not meet the expectations I had built up in my head. Yes this story reminds me of a child’s classic fairy tale however the endings were a little too standard for my taste. I might be a cynic but I was expecting a little more depth to the story although it is readily apparent why Mr. Whiffles is her only companion on her many adventures. The most interesting aspect of this book is the 3 different endings that occur naturally in this story. As you have undoubtedly heard there is an ending to cater to everyone’s tastes however the true ending is strongly foreshadowed throughout the illustrations in the book. With this being a picture book you should pick up on a few key items if you take the time to really enjoy each of the artistically crafted panels. However if you find yourself quickly flipping through the book, stop! Take your time enjoy not only the story but the graphics after all this is a picture book and one that should be proudly displayed. Although you may want to make sure it does stay out of the reach of any young children… if you don’t want to give them nightmares that is. Like the original non Walt Disney version of fairy tales? Then get your hands on this picture book for the mature but young at heart. 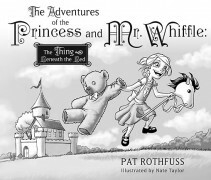 The Adventures of the Princess and Mr. Whiffles: The Thing Beneath the Bed will leave you with a smirk on your face and remind you that even the simplest story can distinguish itself with a little bite.